By using an innovative non-invasive photographic technique, European researchers have managed to locate and map the extensive set of tattoos on the exquisitely preserved remains of Ötzi the Iceman. Remarkably, they even found a previously unknown tattoo on his ribcage. Ötzi's frozen remains were discovered by two German tourists in the Ötzal Alps on the border between Austria and Italy in 1991. He lived around 3,300 BCE and represents Europe's oldest natural human mummy. 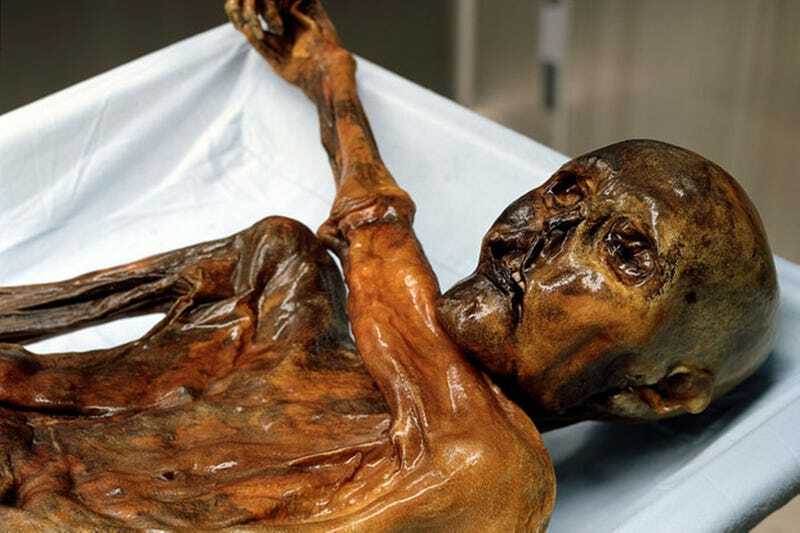 Because he was so well preserved in ice, he has provided anthropologists with a slew of information about Copper Age (or Chalcolithic) humans. His tattoos are no exception. They're amongst the oldest tattoos ever documented in the world, and they're proving to be quite fascinating. From the day he was recovered, scientists have known about the tattoos. But because of the way his body is folded, and owing to his darkened skin, it hasn't been easy to see the tattoos. Now Marco Samadelli, a scientist at EURAC, has mapped every single tattoo on Ötzi's body — all 61 of them, including a new one found on his ribcage. The newly discovered tattoos on the lower right-hand side of the ribcage are striking, because the other markings are mostly found on his lower back and the legs between the knee and the foot. On account of the various locations of the tattoos, some researchers suspected that the marks were part of some therapeutic medical treatment, a kind of acupuncture to relieve pain in the joints. The newly discovered tattoos on the ribcage have now reopened the debate about the role of tattoos in prehistoric times. This investigation has given researchers a new piece to add to the jigsaw puzzle when trying to tease out whether prehistoric tattoos had a therapeutic, symbolic or religious significance. And indeed, his tattoos are located at joints where the body is subject to wear and tear, including his joints. It's worth noting that Ötzi's tattoos were not applied by needles, but by making incisions into which charcoal was rubbed. The results of Samadelli's research can be found in this scientific study. Top image: South Tyrol Museum of Archaeology.